Danilo Gallinari scores 23 points, grabs eight rebounds, and wins MVP as Team World defeats Team Africa in the 2018 NBA Africa Game, 96-92. Blake Griffin led the Clippers to a 108-92 win over the Lakers with 29 points and 12 rebounds. Brook Lopez scored 20 for the Lakers in the loss. Giannis Antetokounmpo and Khris Middleton combine for 56 points and 10 boards, leading the Bucks over the Lakers at home. Isaiah Thomas scores 18 points as the Celtics cruise past the Lakers, 115-95. Eric Bledsoe leads with 25 points, 10 rebounds and 13 assists to lead the Suns in a 137-101 win over the Lakers. Drafted by the Phoenix Suns in the first round (seventh overall) of the 2004 NBA Draft ... Traded by the Suns to Chicago for a future conditional first-round draft pick, the draft rights to Jackson Vroman (31st overall pick) and cash considerations (06/24/04) ... Re-signed by Chicago (07/31/08) ... Traded by the Chicago Bulls to the Cleveland Cavaliers for Andrew Bynum, a 2014 1st round draft pick, a 2015 2nd round draft pick and a 2016 2nd round draft pick (1/6/14) ... Signed as a free agent with the Miami Heat (7/15/14) ... Signed as a free agent with the Lakers on 7/7/16. Has appeared in 749 NBA regular season games (703 starts) during his 11-year career and has averaged 15.8 points, 6.2 rebounds, 2.4 assists, 1.00 steals and 35.6 minutes while shooting 45.8 percent from the floor, 33.3 percent from three-point range and 77.2 percent from the foul line…has missed a total of 135 games during his career, 122 games due to injury, 11 officially listed as DNP-CD (although nine of the 11 he was injured and dressed), one as a healthy scratch on the inactive list and one while in transit after being traded…is a two-time NBA All-Star…captured the NBA’s J. Walter Kennedy Citizenship Award and the NBA Sportsmanship Award one time each…is a four-time Divisional Sportsmanship Award winner…earned All-Defensive Second Team honors once and was an All-Rookie First Team selection…participated in the Rookie Challenge once…has twice led the NBA in minutes per game for a season…has scored in double figures on 611 occasions, including 221 games with at least 20 points, 14 games with 30-or-more points and one 40-point performance…has averaged double figures in scoring in all 11 of his years in the league and at least 15 points in five of the last six seasons…his longest streak of consecutive games scoring in double figures is 33 (Mar. 24. 2006-Dec. 13, 2006)…his longest stretch of consecutive 20-point games is six (Nov. 24, 2013-Dec. 5, 2013)…has grabbed double-figure rebounds 101 times, including one 20-rebound effort…has handed out double-figure assists three times and has posted 97 double-doubles…has 147 multi-trey games…his longest streak of consecutive games with a three-point field goal made is 14 (Feb. 14, 2012-Mar. 16, 2012)…his longest streak of consecutive games played is 108 (Apr. 2, 2010-Jan. 21, 2012) and his longest streak of consecutive starts is 353 (Apr. 3, 2010-present)…has recorded 191 multi-steal games and 77 multi-block games…still ranks among the Bulls’ all-time regular season leaders in points (4th), minutes played (5th), field goals made (5th) and attempted (5th), three-point field goals attempted (5th), steals (5th), games played (6th), defensive rebounds (6th), three-point field goals made (7th), free throws made (8th) and attempted (8th), offensive rebounds (8th), total rebounds (9th), scoring average (10th), free throw percentage (10th) and blocks (10th)…has appeared in 48 postseason games (42 starts) and has averaged 16.7 points, 7.0 rebounds, 2.2 assists, 1.15 steals and 40.2 minutes while shooting 45.2 percent from the floor, 26.2 percent from three-point range and 74.9 percent from the foul line…has scored in double figures 41 times in postseason play, including 19 games with at least 20 points and one 30-point effort…his longest streak of consecutive double-figure scoring efforts in postseason play is 23 (May 4, 2006-May 4, 2011) and his longest streak of consecutive games with at least 20 points is four (Apr. 21-29, 2007)…has grabbed double-figure rebounds on nine occasions in postseason play and has posted nine double-doubles…still ranks among the Bulls all-time postseason leaders in field goals made (5th) and attempted (5th), points (7th), three-point field goals attempted (9th), steals (9th), blocks (9th) and total rebounds (10th)…came off the bench in both All-Star Games in which he has appeared and has averaged 5.0 points, 1.0 rebounds, 1.0 assists and 11.5 minutes. 2014-15 (Miami):Started all 72 games in which he appeared for the HEAT and averaged 14.0 points (.469 FG%, .761 FT%), 5.2 rebounds, 1.9 assists and 33.6 minutes…officially missed six games due to injury and was a DNP-CD on four occasions (three times in games he was injured and still dressed and also in the season finale)…sat out one game (Nov. 17) due to a sprained right wrist, one game (Dec. 5) with a right hand contusion, one game (Jan. 21) due to illness and three games (Jan. 27-Feb. 1) with a left calf strain…ranked among the NBA leaders in minutes per game (33rd) and field goal percentage (40th)…led the HEAT in starts, minutes played and three-point field goals made and ranked second in double-figure scoring efforts, field goals made, three-point field goals attempted, offensive rebounds, defensive rebounds and total rebounds…topped the HEAT in scoring 10 times, in minutes 18 times, in steals on 14 occasions, in rebounds seven times, in blocks six times and in assists in four contests…scored in double figures on 54 occasions, including 12 games with at least 20 points and one 30-point performance…grabbed double-figure rebounds on five occasions and posted five double-doubles…scored his 11,000th career point on Nov. 16 vs. Milwaukee…played in his 700th career game at Brooklyn on Dec. 16…made his 700th NBA start vs. Charlotte on Apr. 7…recorded his 700th career steal at Memphis on Dec. 7…Season Highs: 30 points (at Dallas, Nov. 9), 11 rebounds (at Atlanta, Mar. 27), eight assists (twice), three steals (four times), two blocks (four times) and 41:47 minutes (vs. Portland, Mar. 18). 2015-16 (Miami HEAT): Appeared in 74 games (73 starts) for the HEAT ... Averaged 12.3 points, 6.0 assists, 1.9 assists, and 1.0 steals in 32.4 minutes ... Led the HEAT in minutes, three-point field goals made, and charges taken ... Scored in double-figures 47 times, reaching 20+ points nine times ... Scored a season-high 30 points at Atlanta on 2/19 ... Grabbed 10+ rebounds 13 times and recorded 13 double-doubles ... Had a stretch of five-straight double-doubles from 2/19-2/27 ... Scored his 12,000th career point on 11/23 vs. New York ... Grabbed a season-high 16 rebounds on 2/22 vs. Indiana ... Played and started 14 games for the HEAT during the NBA Playoffs ... Averaged 13.3 points, 5.9 rebounds, and 1.6 assists ... Missed seven games due to injury (left hamstring strain, swollen right eye) ... One DNP-CD. 2014-15 (Miami HEAT): Played and started in 72 games and averaged 14.0 points, 5.2 rebounds, and 1.9 assists in 33.6 minutes ... Led the HEAT in starts, minutes played, and three-point field goals ... Scored in double-figures 54 times, including 12 games with 20+ points, and one 30-point performance ... Grabbed 10+ rebounds five times and posted five double-doubles ... Scored a season-high 30 points at Dallas on 11/9, grabbed a season-high 11 rebounds on 3/27 at Atlanta, and played a season-high 42 minutes on 3/18 vs. Portland ... Missed six games due to injury (sprained wrist, right hand contusion, illness, left calf strain), and was a DNP-CD on four occassions. Played in 75 games (all starts) and averaged a team-high 16.5 ppg, 6.3 rpg, 3.0 apg, 1.08 spg and 0.43 bpg in 38.7 mpg (first in the NBA) and shot .426 from the field, .322 from behind the arc and a career-high .816 from the line … led the team in scoring 22 times, in assists eight times and in rebounds seven times … posted a team-high 67 games with 10-plus points, including 22 contests with 20-plus points and one game with 30-plus points … recorded nine double-doubles and tallied 10 games with 10-plus rebounds … shot 11-of-17 from the free throw line in scoring a game-high 28 points against DET (03/31) ... recorded 25 points and four three-point makes at DAL (03/30) ... scored a game-high 28 points to go along with his seven rebounds and five assists versus MIA (03/27) … posted 17 points and seven boards at MIN (03/24) … led the Bulls with 20 points against IND (03/23) ... posted 21 points and five assists versus DEN (03/18) … tallied 26 points, seven boards and five assists versus CLE (02/26) … notched his sixth double-double of the year with 12 points and a team-high 13 rebounds at MIL (01/30) … hit the game-winning shot with 0:03.3 left in overtime at TOR (01/16) and finished with 19 points, a game-high seven assists and six boards … tallied 18 points and two boards versus ATL (01/14) … scored a season-high 33 points and added five boards and four assists at NY (01/11) … recorded third career “4x4” game as he had 19 points, seven assists, five rebounds and four steals versus CLE (01/07) … posted 20 points and 12 boards versus CHA (12/31) … led the team with 29 points and 13 boards at NY (12/21) … tallied a double-double with 19 points and 12 boards at PHI (12/12) … netted 22 points, five boards and three steals versus NY (12/08) … posted 25 points, seven assists and seven boards versus PHI (12/01) … tallied a team-high 22 points and six rebounds versus DAL (11/28) … recorded a double-double with 19 points and 10 rebounds at HOU (11/21) … posted a game-high 26 points and added 11 boards versus BOS (11/12) … recorded a team-high 27 points (3-6 3FG) versus OKC (11/08) … scored a team-high 23 points and pulled down eight rebounds versus ORL (11/06) … posted a game-high 19 points in addition to eight rebounds versus NO (11/03) … missed five games with a right hamstring injury (01/19-01/26) and two games with a right hip injury (04/07-04/09) … 2013 Playoffs: Appeared in five games (all starts) and averaged 13.8 ppg, 7.6 rpg, 3.8 apg, 1.00 spg, 44.8 mpg and shot .381 from the field … posted two double-doubles … played 56:45 in Chicago’s triple-overtime Game 4 win versus BKN (04/27) and finished with 15 points, eight boards and six assists. Averaged 11.7 ppg, 5.3 rpg, 2.2 apg and 27.3 mpg, while shooting .434 from the floor, including .265 from three-point range, and .741 from the free throw line … played a rookie season-high 47 minutes at DAL (02/08) and tallied a career-high 30 points (12-21 FG) and a season-high 11 boards, helping Chicago to its first win at Dallas in eight tries … missed 10 games as a rookie with a sprained right ankle (03/04-03/19) and spent the final 10 games of the regular season on the Injured List with a ligament tear in his right wrist (04/05-04/20) … 2005 Playoffs: Sat out with a torn right wrist ligament. Declared himself an early-entry candidate for the 2004 NBA Draft after one season at Duke … appeared in 37 games, including 32 starts … was the Blue Devils second-leading scorer (15.1 ppg) and rebounder (6.1 rpg) … became the 10th freshman in ACC history to lead freshman in scoring, rebounding and field goal percentage (.475) … selected Third Team All-ACC and was a unanimous ACC-All Freshman honoree … earned Most Outstanding Player of the NCAA Atlanta Regional, as he helped lead the Blue Devils to the Final Four … averaged 17.6 ppg, 7.4 rpg, 2.8 apg and shot .542 from the field in five NCAA Tournament contests … one of two players in the ACC to finish in the top 10 in scoring (eighth), rebounding (seventh), field goal percentage (fifth) and blocks (ninth) … recorded six double-doubles on the year … scored 14 points and grabbed a season-high 16 boards in the ACC Championship Game versus Maryland … tallied a season-high 25 points (12-16 FG) in a 70-65 win over North Carolina … named ACC Rookie of the Week on six occasions, good for second-most in conference history … selected to the National All-Freshman Team by Basketball Times, Collegeinsider.com and Rivals.com. 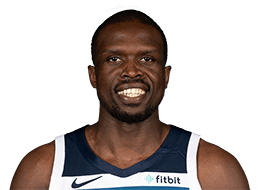 Full name is Luol Deng…has a personal and foundation website (LuolDeng.com/LuolDeng.org)…is the son of Martha John and Aldo Deng…has three brothers (Ajou, Akuei and Deng) and five sisters (Ayak, Akon, Abuk, Arek and Chier)…his older brother, Ajou, played college basketball at the University of Connecticut (1999-2001) and at Fairfield University (2001-03) before playing professionally for five years in Great Britain and Slovakia and also was a teammate of Luol on the Great Britain national team…his sister, Arek, played college basketball at the University of Delaware…lists his parents as the people he admires most and is thankful for all they went through for his family to have a better life…his father, Aldo, served in the Sudanese parliament and became the country’s Minister of Transportation before moving to Egypt to avoid Sudan’s civil war…while in Egypt, he was taught how to play basketball by former HEAT center Manute Bol…in 1993, his father was granted political asylum and moved the family to England, settling in Brixton, South London…at the age of 14, he moved to the United States to play basketball at Blair Academy in Blairstown, New Jersey where one of his teammates was current Dallas Maverick Charlie Villanueva…created the Luol Deng Foundation, which is dedicated to assisting those in need by providing resources and creating opportunities for a better way of life, with hope, integrity and faith as values, the foundation’s wellness, educational and recreational programs encourage and promote progress and improvement in his local community, in South Sudan and all over the world…is also active with Save the Children and Deki, which works to reduce poverty in the developing world through ethical microloans…partnered with Nike, Evelyn Grace Academy and Reforming Black Britain to launch flagship project, DENG Academy…DENG Academy provides a stepping stone for those in South London and surrounding areas with grass roots development techniques and works to create opportunities both on and off the court…DENG Academy has a structured player pathway model to ensure athletes progress through competing at a central venue in national leagues, as well as advancing Luol Deng Foundation summer projects such as DENG Camp and DENG Girls, which is the UK’s first female-only elite basketball program…the Academy also has a scholarship fund to place the most talented kids in USA high schools to follow in Luol’s footsteps…In response to elite funding cuts to British Basketball, founded DENG Camp Top 50, an invite-only three-day camp for the most talented male athletes aged 19 and under all over the UK, handpicked through a panel of national and club team coaches…was part of the NBA’s Basketball Without Borders tour to Africa in the summers of 2006, 2012, and 2013 and to Europe and Asia in 2007…serves as a spokesman for the World Food Programme and also the Nothing But Nets initiative, a grassroots effort to prevent malaria by delivering long-lasting insecticide-treated bed nets…has been involved with the “Lost Boys of Sudan” Chicago Chapter…created a PSA for ninemillion.org to raise funds for refugee children to get an education…co-funded the Chicago Housing Authority’s Holiday Party purchasing 500 toys for underprivileged children for Christmas…made a personal donation to the holiday food drive benefitting the Greater Chicago Food Depository…hosted and underwrote the cost of a Thanksgiving dinner at the Pacific Garden Mission every season while in Chicago…was awarded the Chicago Bulls Charles Lubin Award in October 2006 for his dedication to community service…in his free time he likes to watch TV and movies, read, play video games, cook and travel…his favorite sport other than basketball is soccer and he’s a fan of Arsenal FC...wears size 15 sneakers.